Peer-reviewed journal Biological Conservation has published an article “Worldwide decline of the entomofauna: A review of its drivers” authored by two Australian scientists, FranciscoSánchez-Bayo and Kris A.G.Wyckhuys. The authors concluded that human activity is driving over 40% of insect species to extinction. As the major reasons are named loss of habitat, agro-chemical pollutants (pesticides), invasive species and climate change. Biodiversity of insects is threatened worldwide. Here, we present a comprehensive review of 73 historical reports of insect declines from across the globe, and systematically assess the underlying drivers. Our work reveals dramatic rates of decline that may lead to the extinction of 40% of the world’s insect species over the next few decades. In terrestrial ecosystems, Lepidoptera, Hymenoptera and dung beetles (Coleoptera) appear to be the taxa most affected, whereas four major aquatic taxa (Odonata, Plecoptera, Trichoptera and Ephemeroptera) have already lost a considerable proportion of species. Affected insect groups not only include specialists that occupy particular ecological niches, but also many common and generalist species. Concurrently, the abundance of a small number of species is increasing; these are all adaptable, generalist species that are occupying the vacant niches left by the ones declining. Among aquatic insects, habitat and dietary generalists, and pollutant-tolerant species are replacing the large biodiversity losses experienced in waters within agricultural and urban settings. The main drivers of species declines appear to be in order of importance: i) habitat loss and conversion to intensive agriculture and urbanisation; ii) pollution, mainly that by synthetic pesticides and fertilisers; iii) biological factors, including pathogens and introduced species; and iv) climate change. The latter factor is particularly important in tropical regions, but only affects a minority of species in colder climes and mountain settings of temperate zones. A rethinking of current agricultural practices, in particular a serious reduction in pesticide usage and its substitution with more sustainable, ecologically-based practices, is urgently needed to slow or reverse current trends, allow the recovery of declining insect populations and safeguard the vital ecosystem services they provide. In addition, effective remediation technologies should be applied to clean polluted waters in both agricultural and urban environments. The list of environmental pollutants might be, however, soon expanded. The rapid deployment of the 5th generation of the wireless communication technology (5G), will cause that a huge number of the micro-cell-towers will be densely distributed throughout the urban areas. For the the non-urban areas there are plans to deploy satellites, to the low orbit, that would beam the microwaves and provide internet connectivity for any and all locations on earth. Without an urgent governmental intervention, this might be not so distant future. The 5G-involvement has been pointed out in a recent study. 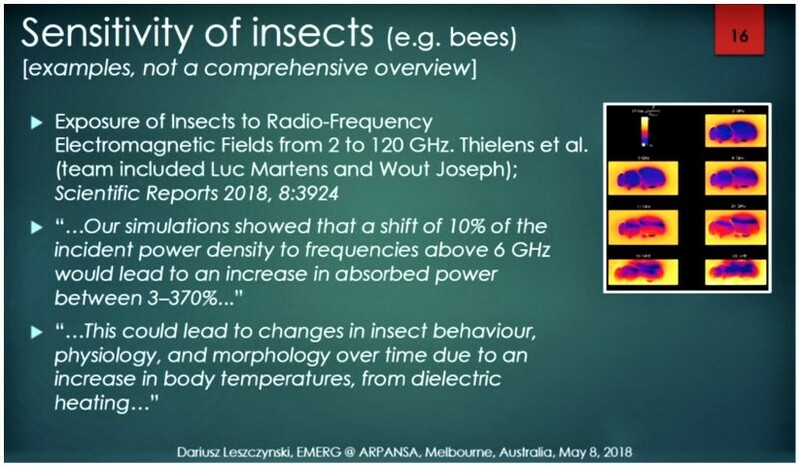 It has demonstrated that the radiation levels emitted by the cell towers of the 5G networks will heat bodies of insects to the levels that will be able to affect their normal physiology: Exposure of Insects to Radio-Frequency Electromagnetic Fields from 2 to 120 GHz. Thielenset et al., Scientific Reports 2018, 8:3924. Here is a slide, from my invited presentation at ARPANSA, Australia in May 2018, concerning this study. The same information I have presented in my August 2018 invited key-note lecture in Seoul, South Korea. Decision-makers have knowledge, but do they have “courage” to act? Time will show. The 5G radiation exposures, either alone or in combination with other insect-depleting factors presented in the article published in the Biological Conservation, might (will) potentiate the insect-killing properties of our environment. It is time to act. It is not possible to rely solely on the self-regulation of the telecom industry by itself or by ICNIRP and ICNIRP’s front organization – the WHO EMF Project. “It is very rapid. In 10 years you will have a quarter less, in 50 years only half left and in 100 years you will have none“. Man-made Armageddon with the 5G involvement? It is not scaremongering. It is a possibility, if we do not act now. The to-date gathered information on biological and health effects of 1G – 5G mobile communication devices suggests that there are sufficient grounds for implementation of the Precautionary Principle, as specified by the European Union. While deployment of new technologies needs to continue, it is necessary to determine whether everything and everywhere needs to be wireless. Especially, the use of optic fiber technology should be considered, whenever possible and feasible, as a reliable replacement for the wireless technology.